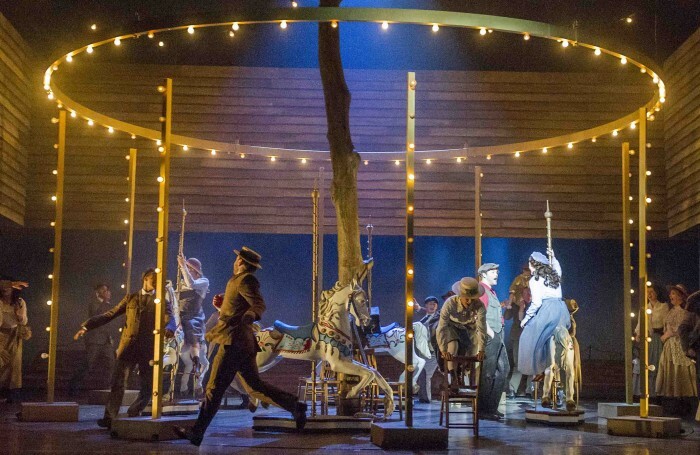 Opera North’s revival of one of the greatest Broadway musicals of all time benefits from Anthony Ward’s revolving set that perfectly captures the circus ride of the title. This technique is later used to bring the entire cast round to look directly out at the audience, breaking the fourth wall. Ward’s shifting backdrops conjure up joyful summer skies, nightscapes full of bad omens and a panelled wooden fence design. The latter serves as a kind of purgatory for the key protagonist Billy Bigelow (the irrepressible Keith Higham). Bruno Poet’s inventive and magical lighting effects also aid in conjuring up the world of the funfair’s carousel. These same beads of light go on to be used in the depiction of the afterlife. James Holmes masterfully conducts the Orchestra of Opera North with great clarity and some highly emotive accompaniment. David James Hulston’s choreography is simply riveting and really adds an extra dimension to the musical format, while Elisabetta d’Aloia creates balletic movement in Act II that is immensely graceful and adroit. Throughout, the ensemble’s vocal performance is outstanding but never better than Yvonne Howard’s beatific rendition of You’ll Never Walk Alone, which is also touchingly reprised by the company in the finale. There is an undoubted feelgood factor to Carousel, but this production also allows for reflection into its darker side, while still sweetening the bitter pill of the tragedy. Its combination of lavishness and high production values – the colour and vivacity of the design and the brilliant execution of the harmonic, hymn-like songbook – creates a celebratory yet cautionary piece of world-class musical theatre.